Dr. Terry Gordon is a highly sought after speaker and educator. Whether co-hosting as a musical entertainer for a United Way Fundraiser, inspiring a group of at-risk youth or encouraging a room full of Hospice workers, Dr. Gordon empowers audiences with his genuine wit, warmth and wisdom. His unique background as a Cleveland Clinic trained heart specialist and bestselling self-help author allows him to combine the groundedness of medicine and science with spirituality to provide a distinct experience for his audience. TEDx Akron (2011) –” The Gift of a New Life” — Dr. Gordon reveals how his traditionally scientific mindset was challenged by something more spiritual. 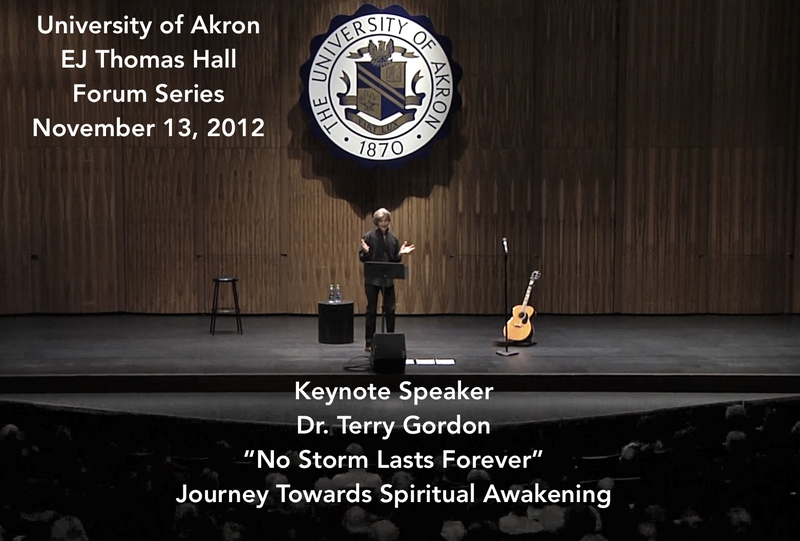 Akron University–EJ Thomas Hall (2012) Keynote– Dr. Gordon shares the story of his spiritual awakening as part of the University’s Forum Series. Dr. Gordon opens for his friend and colleague Dr. Wayne Dyer (Hay House Conference).